About us – Sekortel d.o.o. Evol d.o.o. is a company with almost two decades of experience in advanced business communications, and is recognized by a number of reputable clients in country and abroad, aswell as top telecommunications equipment vendors, who named us their authorized and exclusive distributors in Republic of Croatia and other countries of our region. Besides distribution, in cooperation with our partner companies, our activities are also focused on development of advanced systems and applications in area of ICT. Our experience, numerous references, creativity and flawless professionalism ensure successful cooperation with partners and customer satisfaction, who with new technologies save their time and money, and increase their staff efficiency. We are here to find the best solutions for you, including top quality equipment. Your needs will be carefully analysed by our experts, in order to make the offered solution tailor made for your requirements, while taking care of scalability options for your future growth. 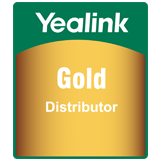 We are a Gold Distributor of Yealink VoIP products, and from their wide range of IP phones we offer to both our partners in distribution and end customers the communication solutions with best price/performance/feature ratio on the market. Our everyday contact with Yealink R&D, marketing and tech support departments enables us to support our partners in best possible way in their efforts to become more competitive in fast growing VoIP market. Business bank: UniCredit Banka Slovenija d.d.